The #1 Choice for many when it comes to storm damage and roof repair in the Midwest. 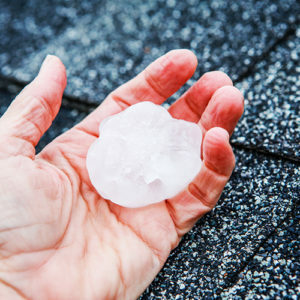 Hail can damage your shingles, siding, or gutters without any visible signs from the ground. Hail normally has to be at least the size of a golf ball before it will break through your shingle and cause bruising. If driven by high winds or if it hails for more than a few minutes, your roof will suffer from loss of protective granules. This will greatly reduce the life of your roof. Siding, gutters and fascia can be dented by hail. Frequently this damage is difficult to see until the light is right. Have the exterior of your home inspected to be safe. We have provided full service to our clients since 1947. Let us help make your storm damage claim less intimidating and insure you receive the best results. Loss of granule layer on the shingle will cause the organic-based center of the shingle to be exposed to the sun’s UV rays. This will cause serious deterioration of the shingle in a short period. Furthermore, hail can actually puncture or seriously damage your roof. Over 50 miles per hour can lift the shingle and cause seals to break, never to be resealed. The unsealed shingles will then flap in the breeze and soon snap off. Improper or inadequate ventilation in your attic will cause the shingles to scorch and bubble up causing a serious problem. An inspection by a trained technician can verify the extent of the damages and outline the means to get them repaired. One of our specialists will meet with you to assess your property. we will inform you to call your insurance company. We will provide you and your insurance company with an initial assessment and estimate of the damages. We will work with you to assure a clear understanding of the process and receive a fair claim settlement. We will inspect your property for visible signs of damage. You are entitled to have the contractor of your choice complete the work. First, we will meet with you to determine the extent of the damage, then we will meet with your adjuster to determine all other aspects. In most cases, all you pay out-of-pocket is your deductible. Most discrepancies occur when the adjuster has not assessed the same amount or type of damage as the contractor. Whether it’s for the roof, gutters, siding, or other exterior damage, we work with the adjuster in finalizing the cost of the repairs and getting your claim paid. You should receive the first check about a week after the adjuster has estimated your damage. This check represents the actual cost to repair or replace the damaged property, less depreciation and your deductible. The age and condition of the property is taken into account when calculating depreciation. The depreciation amount will be paid when work is completed and an invoice is sent to the insurance company. If you are carrying a mortgage on your home, the first check you receive from your insurance company should be made out to you and your mortgage company. The check along with required documents of your mortgage company must be satisfied to clear your check. We assist you with this process, or if desired, complete it for you. We roof per the National Roofing Contractors Association guidelines. We strip off the old shingles and check for any bad decking or chimney flashing. We apply felt, ice and water shield (if code), re-roof to code using four (6) nails per shingle. Please keep in mind that this is a major construction project. Shingles, particularly second layers, come off in pieces. Expect a bit of a mess no matter what contractor does the work. Be sure the items on the interior of your home that react to vibration during the installation process are secure. We will clean up and haul away trash including picking up nails with a magnet. In most cases, re roofing can take one to two (1-2) days to complete. If you’re ready to get your FREE estimate and learn what roofing solution is right for you, contact John Beal Roofing today! Roofing Website Design By John Beal Management, Inc..
© 2018 John Beal Management, Inc.. All rights reserved.